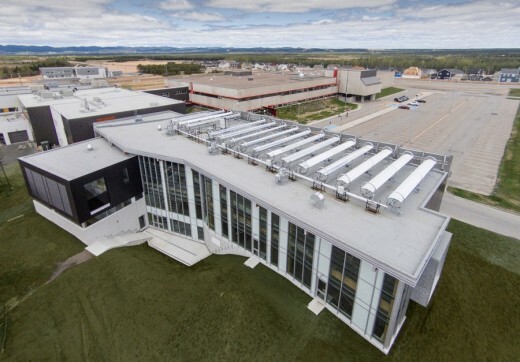 In 2011, within the framework of its factory expansion projects, Aluminerie Alouette struck an accord with the Government of Quebec to finance the construction of a university building in Sept-Iles with the goal of improving access to graduate studies in the region. 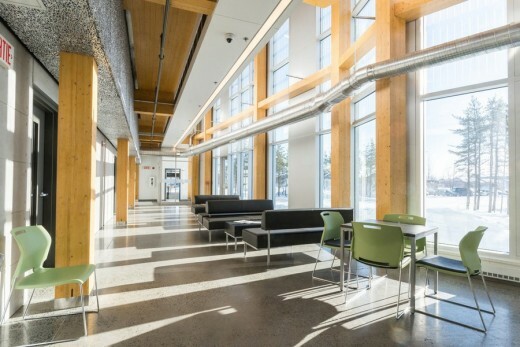 Inaugurated in December 2014, the Alouette-UQAC university building has a floor area of 3,200 sqm spread over three floors and a capacity of 400 students. 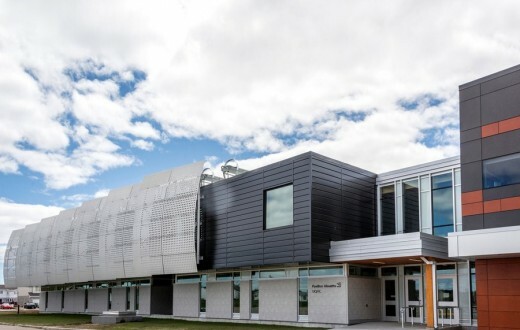 The new building shares services with the Cégep de Sept-Îles on a common campus located in the heart of a residential area. 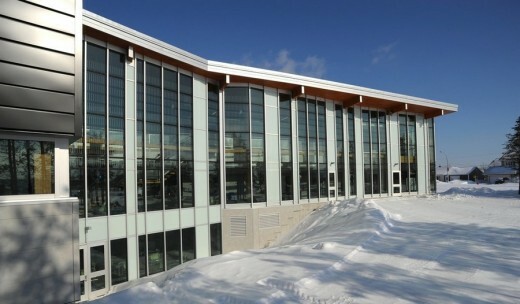 The new project features more than 50 rooms, including several classrooms, four laboratories, multipurpose meeting spaces, two video conference rooms, an educational software library, a computer lab, offices for grad students, teachers, and researchers, administration offices, a student living area, and a multi-functional atrium. 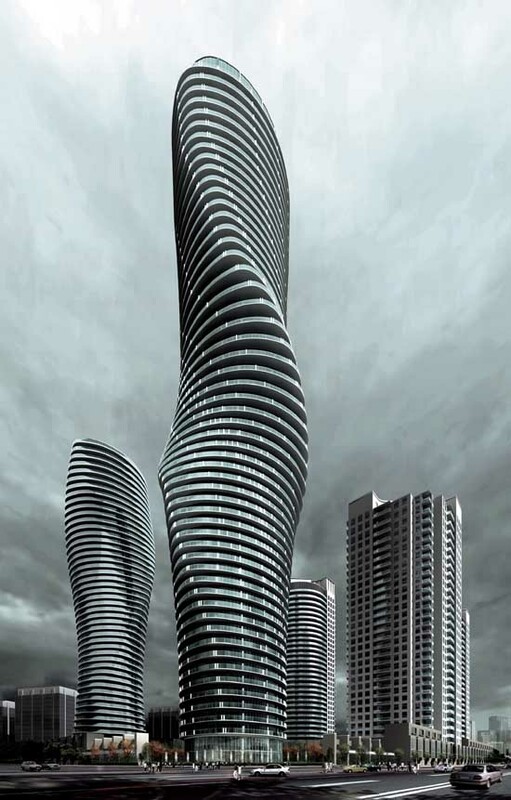 •	Create links between the two existing buildings by adding a third. •	Upgrade the institution from junior college-level to university status. •	Reaffirm the importance of both institutions to the community. •	Through the design of the building itself, attest to the importance of the aluminum industry to the region. 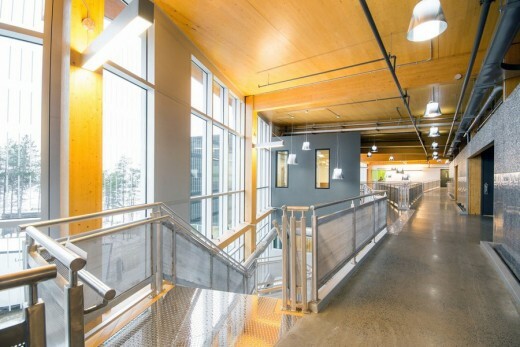 •	Design human-scale spaces that inspire learning. 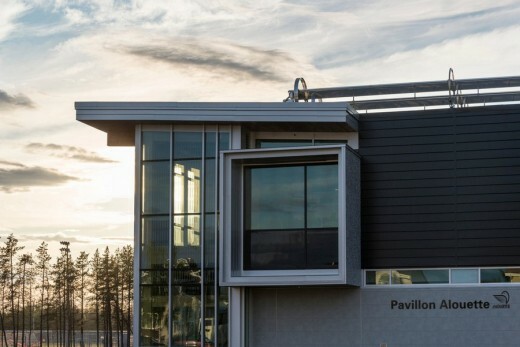 The design concept underlines the participation of the building sponsor by creating an analogy between the industrial aluminum production process and the learning process. In both cases, raw material is processed and results in a refined product: in the industrial process, this leads to refined aluminum while in the academic process, it leads to knowledge. Advanced environmental technology plays a significant role in the project. Sustainable development strategies were divided into three categories: bioclimatic architecture, high-tech solutions, and low-tech solutions. 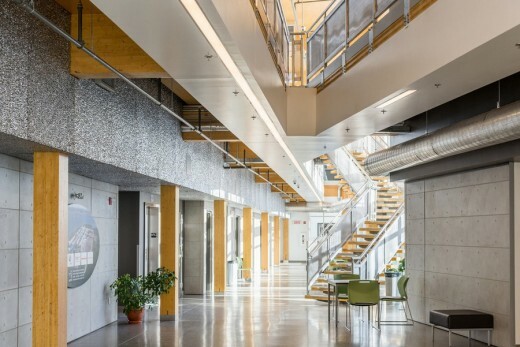 •	Passive solar heating: the atrium features a south-facing curtain wall with silkscreened glazing to prevent overheating and buffed concrete floors for efficient thermal mass. 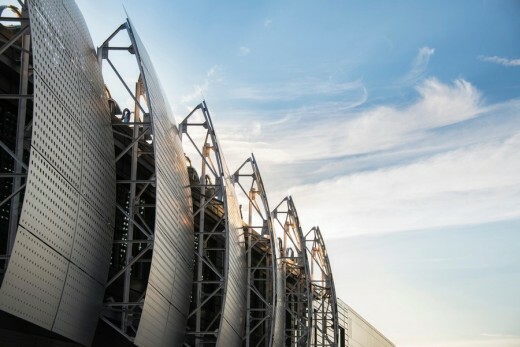 •	Parabolic solar heating system from Rackam http://www.rackam.com, consisting of 15 adjustable aluminum reflectors on the rooftop. This technology is combined with an ejecto-compression cooling system, enabling both heating and air conditioning by solar energy. •	Horizontal geothermal system and thermal storage. These systems were networked with the parabolic solar heating system in order to augment the performance of the system as a whole. 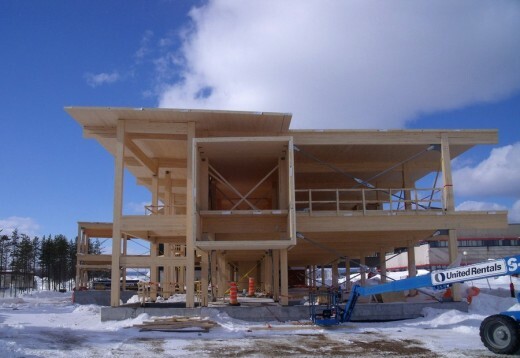 •	Wood structure featuring glulam timbers and cross-laminated timber (CLT) panels. 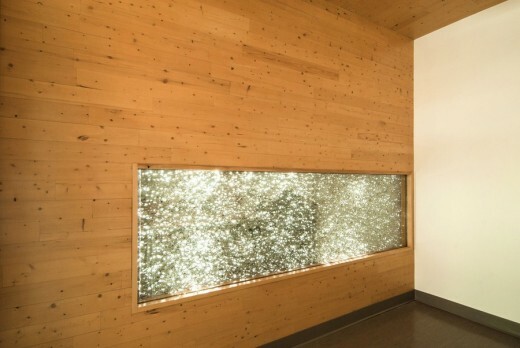 Wherever possible, the structure was left visible, reducing the quantity of finish materials required. 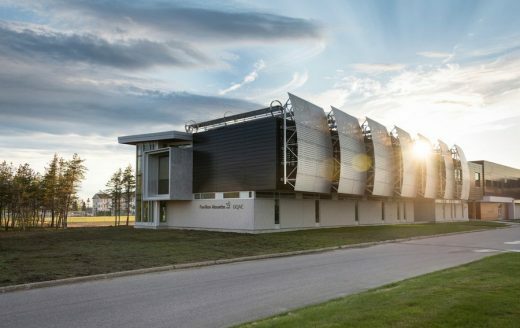 •	Thermal resistance of building envelope 25% higher than required by the National Energy Code for Buildings (NCEB). 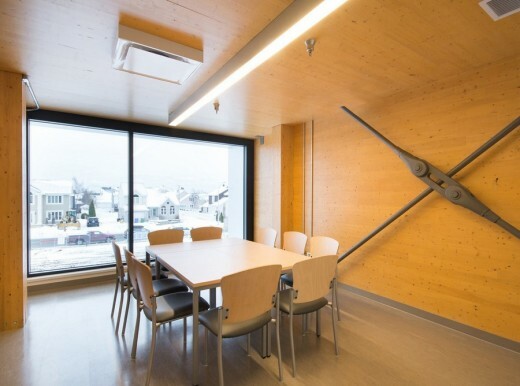 •	45m² solar wall preheats fresh air before it enters the ventilation system. •	Modular reusable partitions enable the creation of multipurpose spaces as well as the reuse and recycling of materials for future uses. •	Four cisterns collect rainwater from the roof for use in sanitary fixtures and for exterior irrigation. 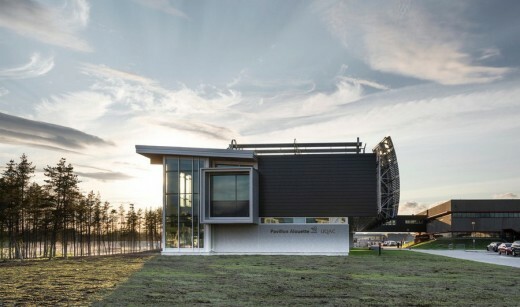 To sum up, the richness of the learning environment created by BGLA demonstrates our dedication to making our client’s vision a reality, providing a true crossroads of knowledge for North Shore students. The wide variety of ways aluminum was used in the building emphasize the many construction methods and forms made possible by this highly technological material produced in the region (curtain wall mullions, modular reusable partitions, recycled aluminum foam cladding, solar reflectors, the “knowledge filter” structure in the northeast façade, central stringer and railing of the monumental staircase in the atrium, etc. ).